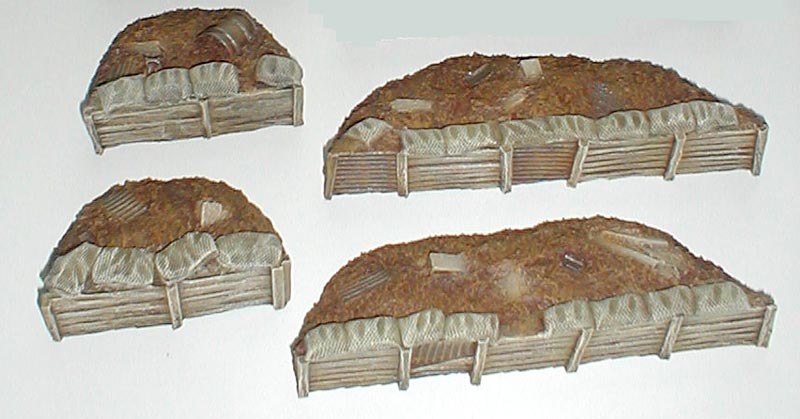 The dugout range represents basic emplacements, constructed with an excavated earth rampart, shored with timber and a sandbag parapet. 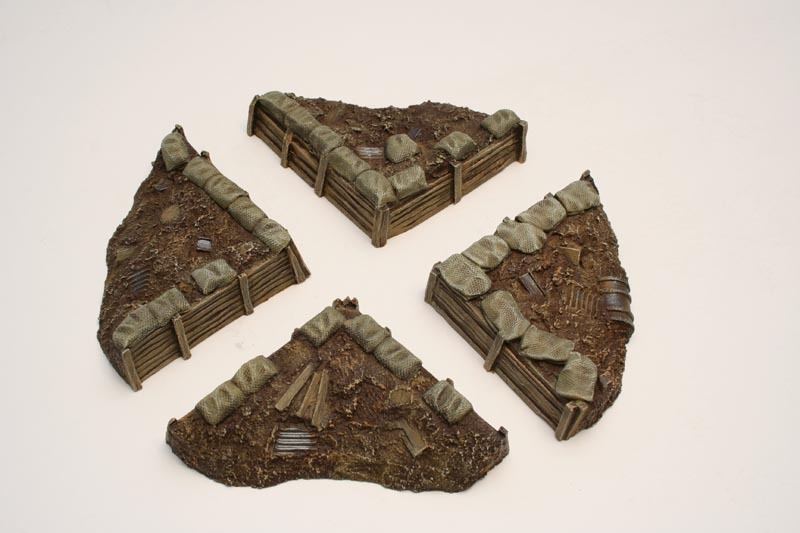 The dugouts have a scattering of battlefield rubbish, corrugated iron and duck board floors for added realism. This piece measures - 190mm x 110mm with an internal space of 75mm x 60mm, enough for 5 figures, support weapon or armoured vehicle. 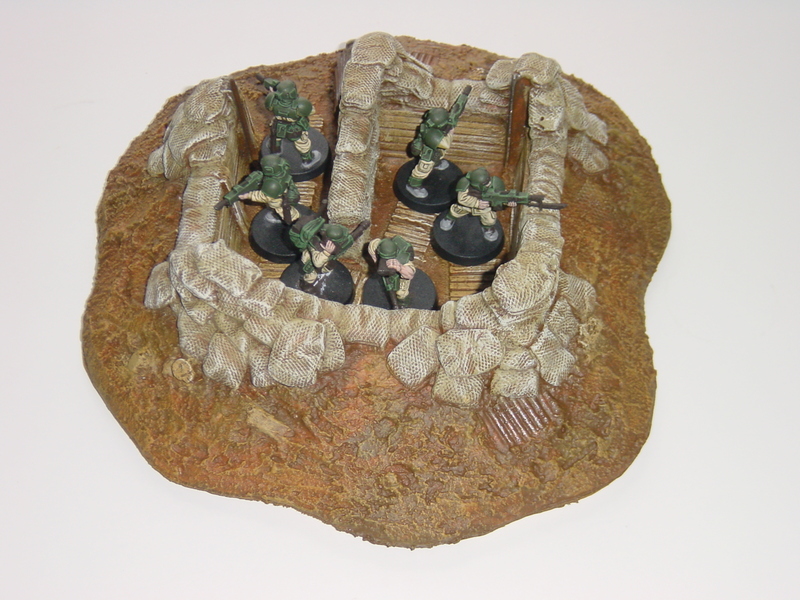 This piece is designed to hold a 60mm diameter support weapons stand and crew. 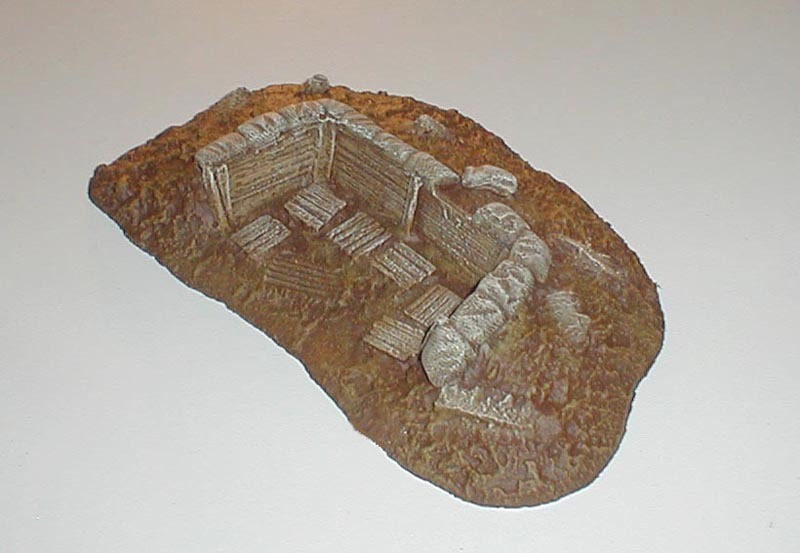 This piece has a removable roof to allow placement of figures. Bunker with the roof on. 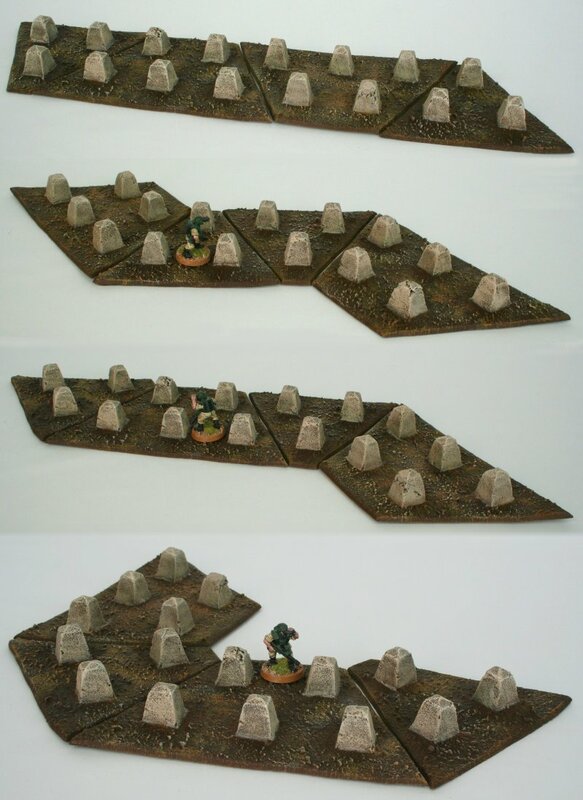 This pack contains 4 pieces, 2 x 75mm long and 2 x 150mm long. This item can be ordered in 1 metre lengths. Click add to basket and modify quantity in shopping basket screen for multiple purchases. 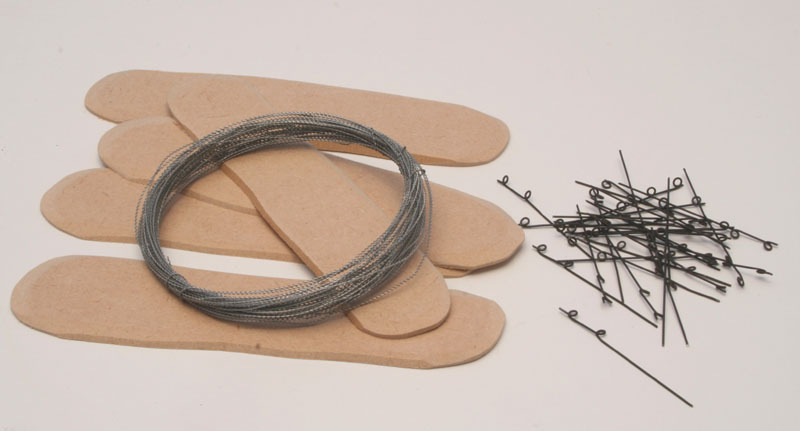 This pack contains 10 wire pickets which can be used in conjunction with our barbed wire to make wire defences. 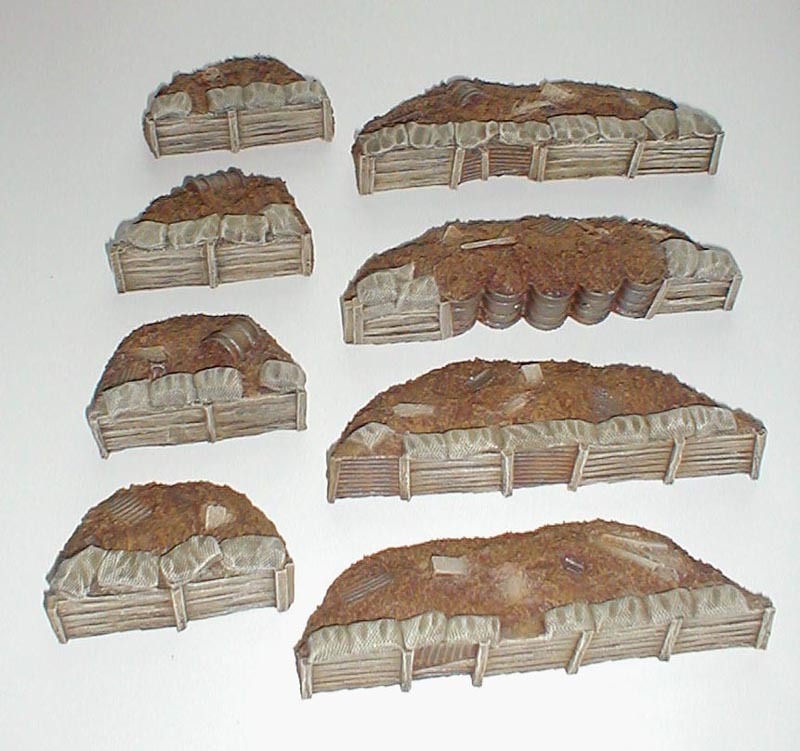 This pack contains 4 pieces which can be used in conjunction with our dugout range to make a zig-zag trench system. Alternatively, used by themselves, they can be set up as separate strong points. 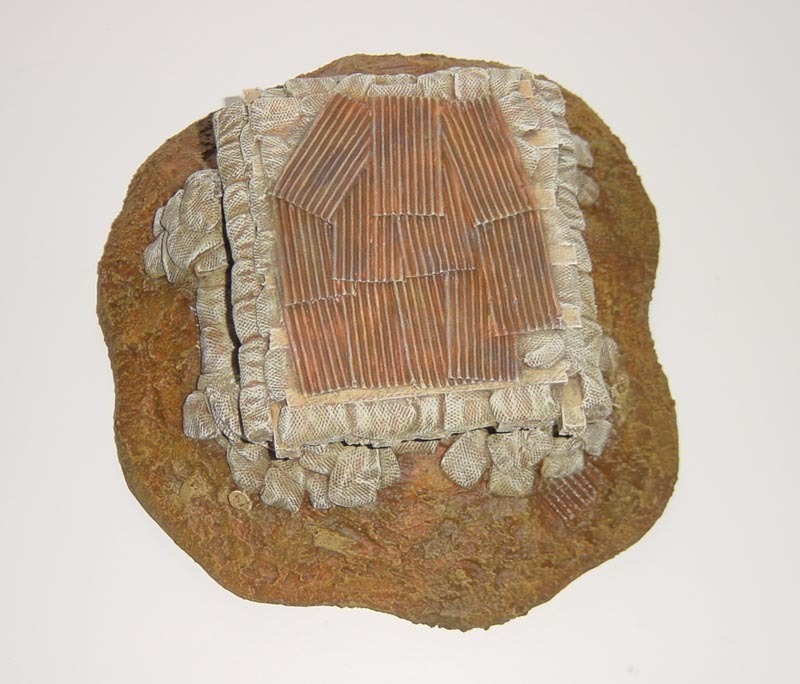 They are approximately 100m across the ends and can provide cover for 3 figures on conventional slotter bases. 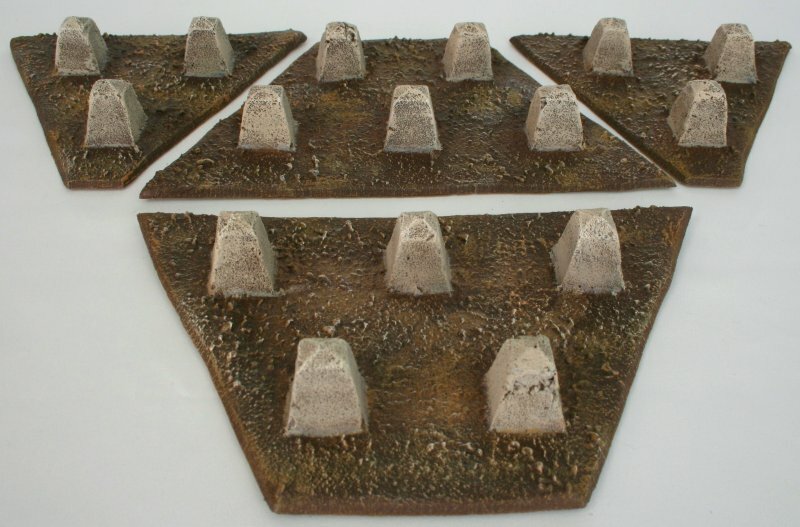 This pack contains 4 pieces and is used in conjunction with the 90 degree corners and earthwork straights to create an enclosed zig-zag trench system. 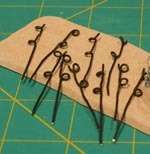 This pack contains 5 pieces of basing, 10 metres of 'barbed wire' and 25 picket posts. 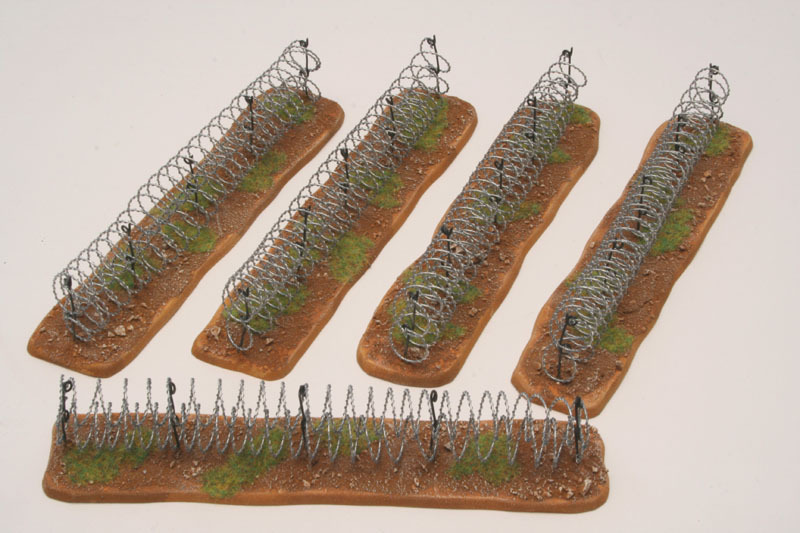 It is a combination of the kits above and will allow you to make 5 stands of double concertina wire approx 125mm / 5" long. Note: the flock and basing texture are not included. 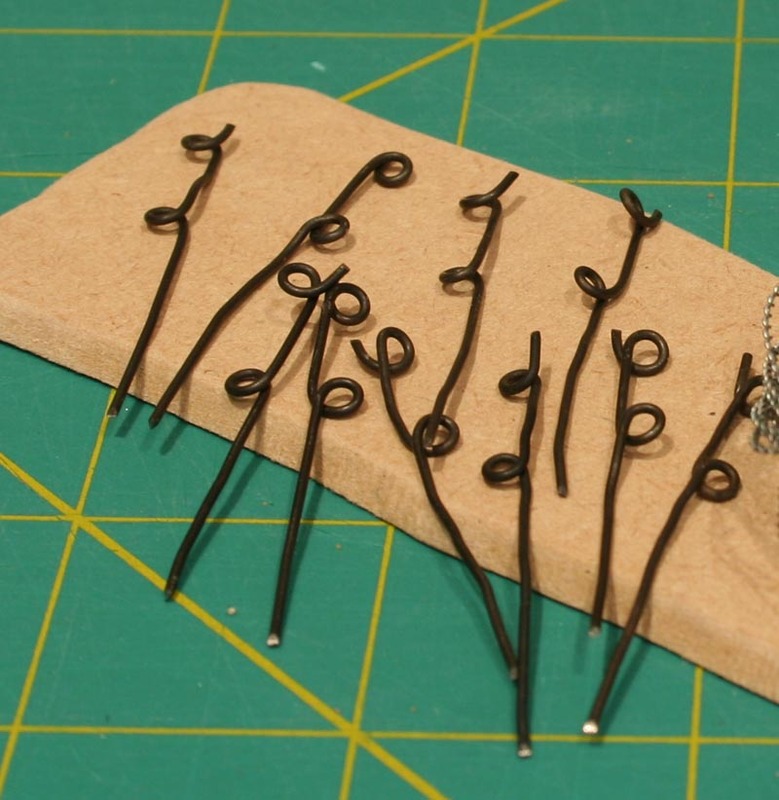 See our Modelling Tips on how to create this. 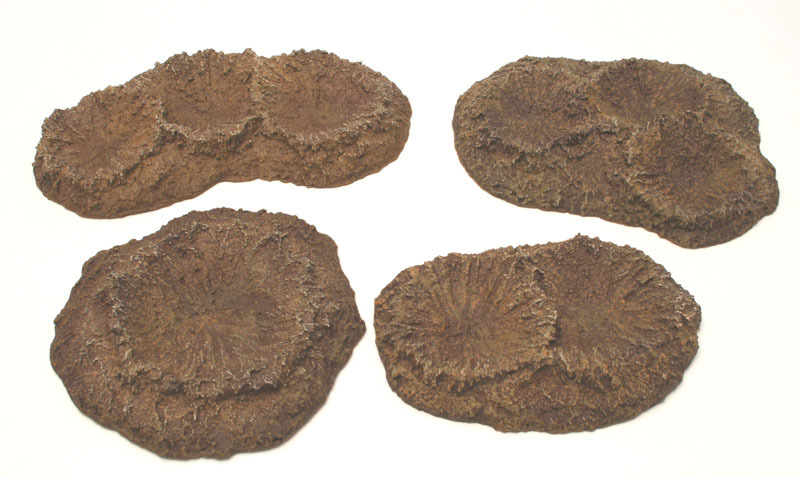 This pack contains 4 pieces and represents the blast effect of large shells. 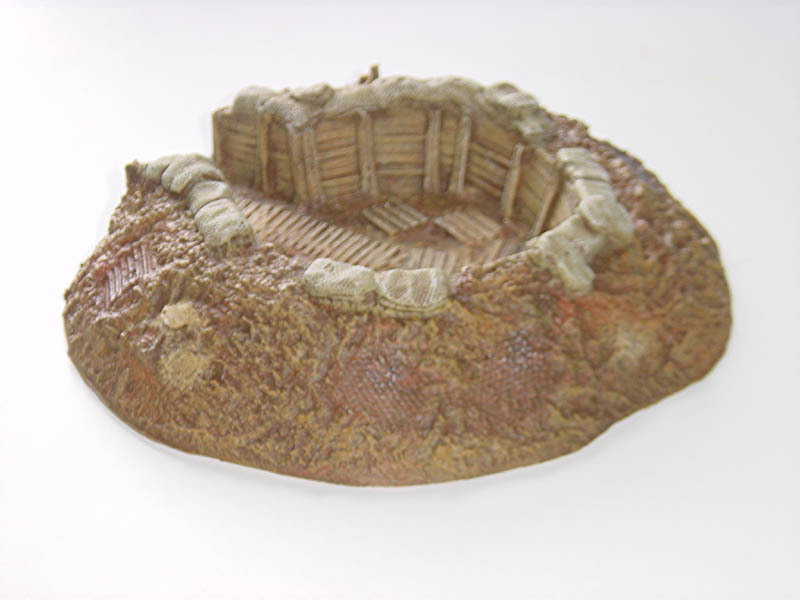 It contains a large single hole (120mm in diameter) suitable for weapons teams and 3 multi-crated pieces with each crater large enough to hold an individual figure. The tallest point is about 25mm. This pack contains 4 pieces. The 3 trap piece has a long edge 125mm, parallel short edge 20mm, 110mm wide, and the angle is about 65 degrees. 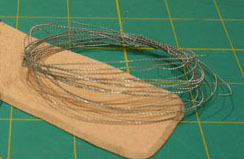 The 5 trap piece has a long edge 175mm, parallel short edge 70mm, 110mm wide, and the angle is about 65 degrees. The tallest point is about 25mm. This gives a total length, in a straight line, of 390mm (as a long parallelogram) by 110mm. See here for example configurations. This pack contains 4 pieces. There are 3 pieces approximately 130mm long, and 1 shorter piece approximately 90mm long. 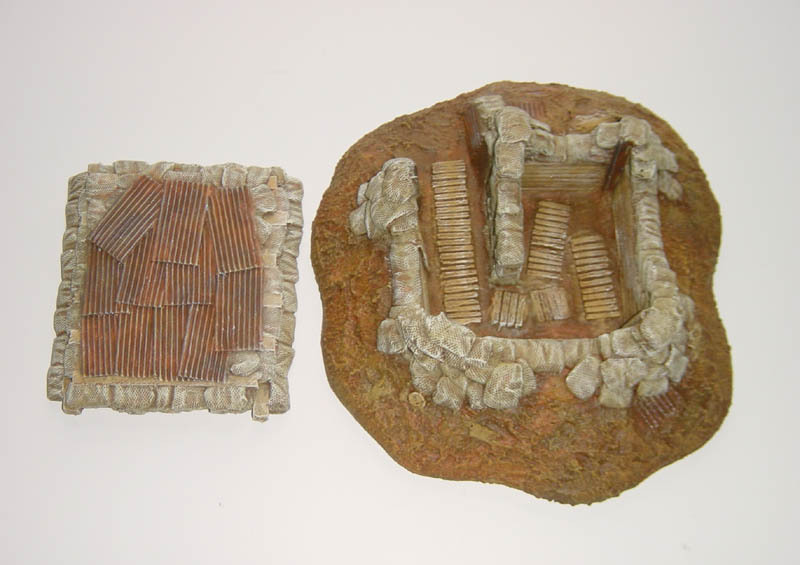 All are 28mm high and 22mm wide. They represent the Mil 1 design of HESCO unit that is 1.37m high and 1.06m wide.